Read this blog to discover an easier way to work using SOLIDWORKS PDM, Standard and Professional, Solutions. How often have you been there? You’re traveling for a few days or working from home. You have a project that is nearly finished. You hop into your favorite design tool, SOLIDWORKS, and go to create a drawing of your brilliant design when you realize you don’t have your drawing templates. They’re carefully shared on a network drive, on the server, at the office…and you’re not there. Commence eye rolling and cursing. OK, maybe later. At least you can add those finishing touches to the assembly. There are still a few unplaced fasteners…but Toolbox is also shared on that same !$#$% server. That’s when many of us decide, to the dismay of our IT department, that we need our own personal copy of everything. But then we gripe and grumble about the micro assembly designed by a colleague that opens with giant, default fasteners on our machine, and about the drawings that don’t share the agreed-upon templates and settings. There is a better way! SOLIDWORKS PDM, Standard and Professional can be set to automatically copy or refresh everything from selected folders – every time you log in. You can have an up-to-date copy of the most important content, whether you’re connected or offline. That includes Design Libraries, templates, Toolbox or anything else for that matter. It doesn’t just apply to SOLIDWORKS either. Shared libraries for any application can be synchronized the same way if they can be set as a folder location. 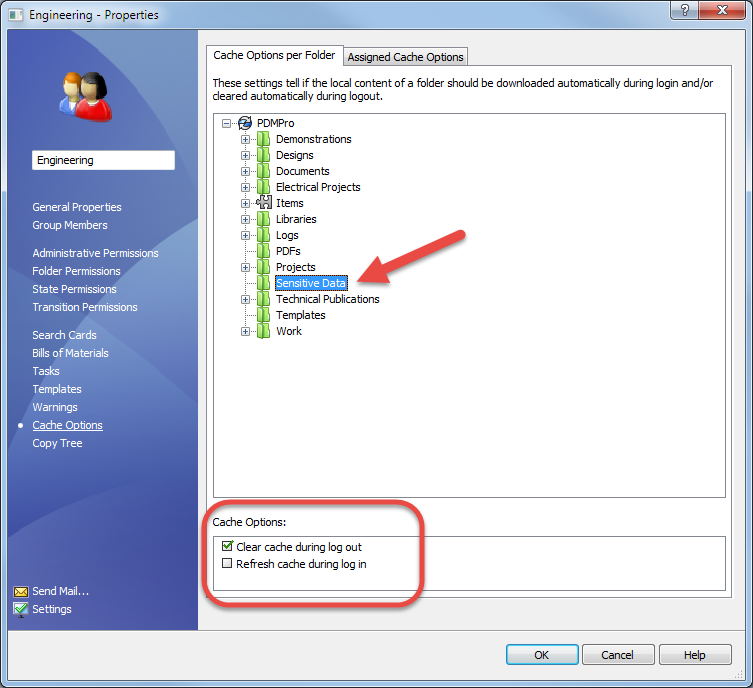 You can set Cache Options for a user or group in the SOLIDWORKS PDM Administration tool. To do this, first select the Cache Options category and select a folder. Check “Refresh cache during log in.” Turn it on for as many folders as needed. The setting applies to all sub-folders automatically. When the user logs in, if they already have the latest files, nothing happens. If a newer version exists on the server, the file is updated locally. If it’s their first time logging in, the files are all copied to their local view and the user is ready to design. You probably noticed the option to clear files during logout as well. Consider this option for sensitive data folders that shouldn’t be left on a user’s local computer. 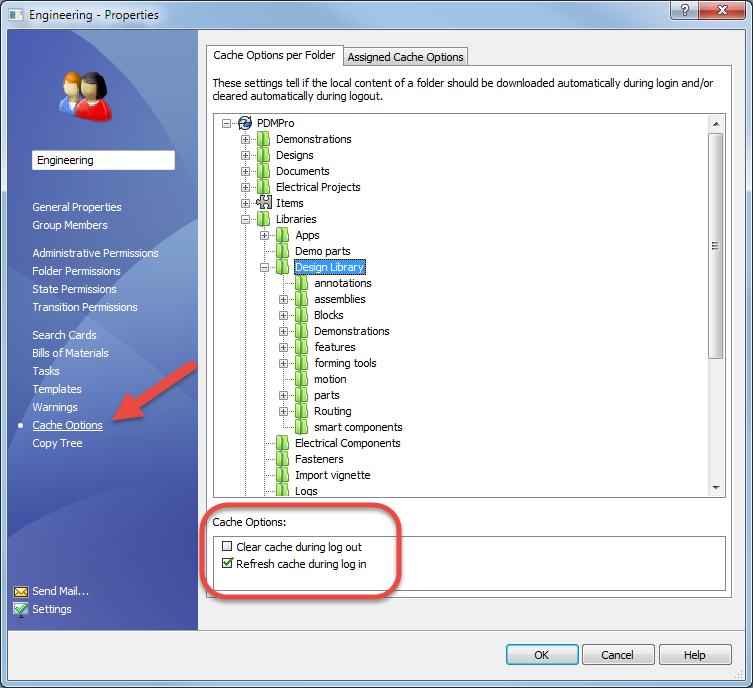 Either way you use them, the SOLIDWORKS PDM Cache Options can save you the headache of making sure you have everything you need, whenever you need it. It pays to share. This post was originally published By Mike Spens on the SOLIDWORKS Blog and is being reposted here with permission from Dassault Systemes SolidWorks Corporation.